I look forward to this time every year when we can get fresh peaches by the roadside or at the local market. This year I was able to get some small but delicious peaches that were just about ripe but not quite. So, I put them in a bag and today they were perfect. Instead of putting the peaches on my oatmeal this morning or having them in a bowl with cream, I decided to make a peach upside down cake to finish off the big dinner that I cooked today. Oh, am I glad that I did because the cake was delicious. 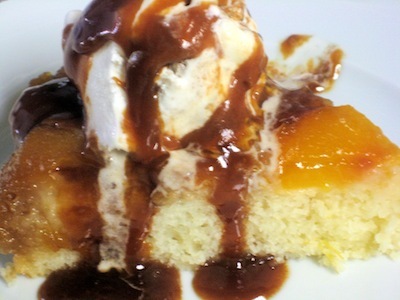 You know me; I cannot just make a cake, so I had ice cream and caramel sauce with it. And, here I am on a Sunday afternoon and I have devoured a good old timey country garden dinner of barbecued chicken, speckled butter beans, potato salad, sliced tomatoes, cornbread, chow-chow, and now peach cake. What more could I ask for? A nap! Prepare the peaches by peeling them, and then cutting into small slices. Put 1 teaspoon lemon juice over the peaches. (Save any peach juice from the bowl and add it to the cake batter after the peaches have been added to the hot sugar mixture). On top of the stove over medium low heat melt the butter and sugar in a 9-inch round metal cake pan until butter and sugar are melted. Spread out evenly with a spoon if needed. Add the peaches while the cake pan is still on the stove top. Any peach juice left over from bowl after placing peaches in cake pan. In a medium size bowl add the above ingredients. Using a wire whisk, mix well. 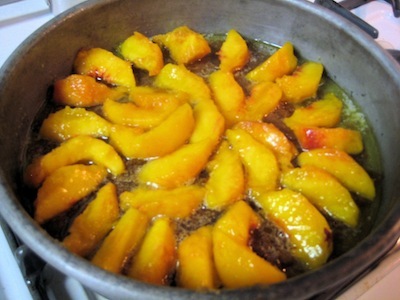 Set aside the batter while you put the peaches in the cake pan over the melted butter and brown sugar mixture. Add any leftover peach juice from the bowl to the batter at this time, and mix the batter again. Spoon the batter over the peaches and bake in a preheated 350ºF oven for about 25 minutes (start checking at 20 minutes) or until a cake tester inserted into the center of the cake comes out clean. Wait 5 minutes after removing from the oven and then invert onto a heat proof serving plate. Serves 6. This is how I ate the cake! I put a small piece of cake on a dessert plate and then I put a scoop of butter pecan ice cream on top, and ladled a FEW spoonfuls of caramel sauce on the top of the ice cream. Buy the sauce if you like. I made this one and it is a little more bitter than most. I used a half cup sugar and cooked it in a heavy skillet over medium heat until it was brown and bubbly. Then I added a cup of heavy cream and cooked until smooth. This mixture will turn into a glob as soon as the cold cream hits the hot sugar but it will smooth out. Be very careful, because there is nothing hotter than cooked sugar. I store the sauce in a glass jar in the fridge. It will keep as long as the cream will keep. If it hardens, microwave it until spoonable.